The annals of our parish would certainly not be complete without some allusion to that catastrophe which so recently brought fish out if its obscurity into a sad prominence before the whole world, we mean the Pit Explosion which took place on the morning of 22nd October 1877. Up till then Scotland had been peculiarly fortunate in being exempted from those terrible Colliery accidents which were too often experienced by the mining communities of England and Wales. But now its turn had come; and the records was to be made in a page of its history, of one of the most devastating explosions as had happened in any land. By it, "in a moment, in the twinkling of an eye," 218, if not more, men and boys were killed, leaving behind them, to the mercy of God and man, 106 widows, 300 fatherless children, and about 50 other relatives, such as aged parents, who were more or less dependent upon the dead. What a gloomy morning that October Monday was. How indelibly it is engraven on our memory. We were dressing at the time,. The window of our room looked over against the pits. A sudden flash darted up from the most distant shaft, accompanied by debris, and a report not very loud; then forthwith there arose from the shaft nearest to us a dense volume of smoke, "the blackness of darkness," which spread itself, a terrible funeral pall, over the surrounding plain. We were soon at the scene of the disaster, whither hundreds of eager and terrified creatures were hurrying, and there for hours we remained, a stricken shepherd amongst a stricken flock. The one shaft was blocked up with ruins, but the other was partially clear; again and again did gallant men descend to rescue, if possible, their buried comrades, but all in vain; the merely succeeded in bringing up a few dead bodies, when they themselves were overpowered by the choke damp and had to be brought up to the surface. Some of them were more dead than alive, and it was with difficulty we succeeded in restoring them. Still, no matter the danger, there were no lack of volunteers, many of them wildly demanding to be lower down, until at last, when the short winters day was drawing to a close, imperative orders were issued that no more lives were to be risked. Then hope fled; and the agonised crowd were left in the darkness and pitiless rain to face the terribleness of its magnitude that not one of the 200 miners and more, that were entombed beneath us, would ever see the light. Nor did they. Day after day for three weeks following, and after laborious exertions, were the bodies found and brought up for internment. With the exception of the Roman Catholics, and there were not many of them, and a few others, all the dead were laid side by side in two long trenches that had been dug in the newly made cemetery. The report of the funerals in one evening, as given in the Herald, was characteristic of them all: - "the scene in the parish burying ground, where the bodies where interred, was very impressive, and by the time that Mr Wright got as far in the service at 'Earth to Earth, Ashes to Ashes, dust to dust,' many of the onlookers were in tears. Few of them will soon forget the sight - the cold grey twilight, the dark overcast sky, the long deep trench, the silent uncovered multitude, and the solemn tones of the preacher's voice"
"Erected by William Dixon, Ltd, in memory of 240 of their workmen who were killed by explosions in Blantyre Colliery on 22nd October, 1877, and 2nd July, 1879; and many of whom are buried here." Gradually the dead were buried; but the living remained, bereft of their breadwinners. No time was to be lost; starvation must be averted; so on the morning after the disaster, surrounded by widows and orphans, we issued, through the kind reporters, the following appeal: - "We, the undersigned, appeal to the sympathies of the nation on behalf of the mothers, wives, and orphans, who have, in very many cases, been rendered perfectly destitute by the terrible Colliery explosion which has occurred in this district. 218 men and boys have been killed, all the male members of several families had been swept away, and widespread desolation prevails. There is lamentation and bitter weeping. Contributions are earnestly solicited to meet the destitution of the afflicted families"
And what a response came to that appeal! The rich man's thousand and the widow's mite; the noble lady's gift of a hundred mourning dresses, and the orphan girls gift of a few pair of warm, knitted stockings. Here is still before us the pile of letters which we keep with a kind of reverential feeling, for they tell of the noble sympathy and brotherly kindness of whole nation, from our beloved Queen to some of the poorest in her realm. The citizens of Glasgow were not slow to take up the cause of the bereaved. A meeting was called together by the Lord Provost, when an influential committee was appointed to collect subscriptions, and frame rules for the distribution of relief. Through their exertions, the contributions speedily reached magnificent total of £48,246; and under their unwearied superintendence the remaining widows and orphans still receive their allowances. They have never known a moments want, and never will, as long as they continue on this fund. What a blessing it has been; and how earnestly we wish that such a fund was in existence and the wide basis, to meet the destitution arising from accident, serious and fatal, that are continually happening in our mining districts. 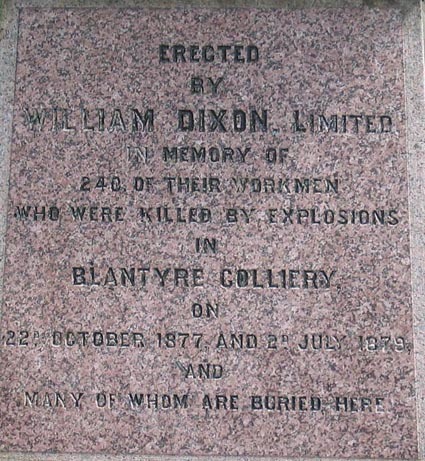 Appalling Colliery Accident at High Blantyre – More Than 200 Lives Lost - One of the most appalling colliery accidents that have ever happened in Great Britain, and certainly the most serious that has occurred in the history of mining in Scotland, took place yesterday morning at the High Blantyre Works of Messrs W. Dixon & Co., coal and iron masters. From the nature of the case, accurate details as to the number of persons killed cannot be ascertained, but it feared that no fewer than 200 miners have had their lives cut short either from the effects of the explosion or by the deadly after-damp. "I descended into the pit at a quarter past four o'clock in the morning along with John Little and the underground manager , John Pictering. He explored the whole of the workings thoroughly, and found them all right, and the ventilation free. The men commenced to come down the pit at half-past five in the morning, and all were down a few minutes past six o'clock. The total number, according to the justiceman at the pit-head, including ourselves, being 107. Fires had been duly lit previous to this, and the men commenced to work as usual about half-past eight, or between that and twenty minutes to nine. Little Pickering and I left the levels and came to the pit mouth for the purpose of ascending the shaft, in order to take breakfast. We reached the pit-head, and were engaged in putting a double decker on the low side of the cage, when at ten minutes to nine o'clock we were put into terrible confusion. At that time there were about twenty men at the pit-head some drawing the hutches from there to the waggon coups , and others attending to the various duties which they find at the pit-head. Suddenly we were startled by a report like the firing of many cannons , but loader than the loudest thunder I ever heard. This was followed by dense volumes of smoke ascending the shaft, and then a vast sheet of flame rolled up with a hissing noise from the pit, succeeded by showers of wood and dirt and stones , like what have read comes from a volcano. Among the debris to our horror was the mangled limb of some unfortunate boy. This eruption was simply appalling , and lasted from four to five minutes. Then all was quiet. Many of those at the pit-head had their whiskers, eyebrows , and hair singed, and the manager Mr Watson has his face and hands scorched. We looked into each other's faces, each fearing to say a word, because we only knew too truly what had happened. We were paralysed, but only for a minute. We ran to No. 2 pit to see what could be done there, but found the connection stopped, although some men were got out. Then we came back to No. 3 pit, all our wits now about us, unhooked the cage from the tow rope, and put on the "kettle." The "kettle" is a barrel-like vehicle which is used mainly in sinking pits, and which from its shape will go down or up a shaft where a cage can't go. Many men were anxious at once to descend into the pit and explore, anxious not only to save our mates, if possible, but to learn the true position of affairs. It was evident, then, from the pit-head that many slides were out of their places, and that a portion of the midwall had been broken down. 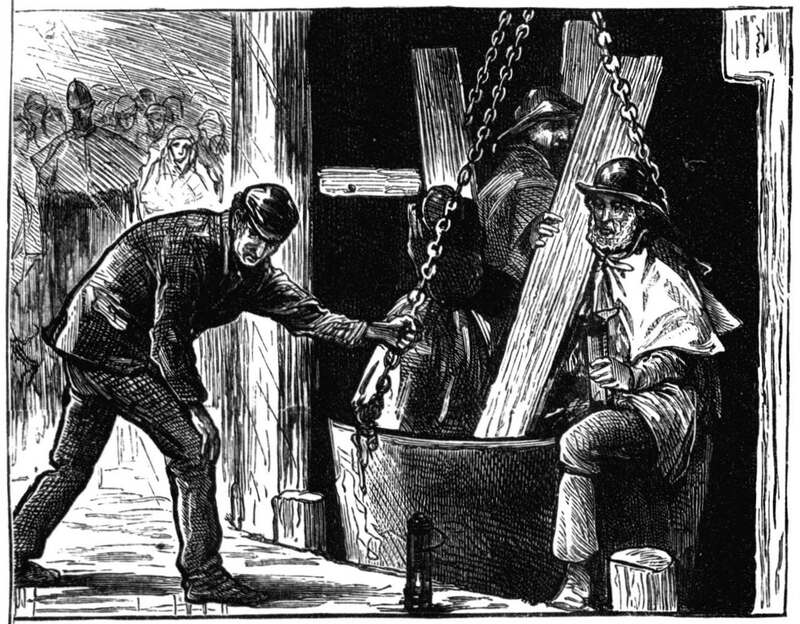 John Pickering, a Cornishman named Coulter, and myself, got into the "kettle," and were lowered down. We got about thirty fathoms deep, when we found the bell gear all broken, and the needle, or the stay in the centre of the pit which keeps everything correct , thrown right across the shaft. We were therefore compelled to ascend to the surface for the purpose of getting materials for connecting the bell wire. The next gang that went down consisted of Thomas Cox, William Mason, and a stranger, and they endeavoured to clear away part of the obstruction but found it necessary to return to the surface . After that, a man named Gilchrist, a stranger, and myself went down, connected the bell-wire, got away part of the obstruction wood, and got as far down as 120-fathoms, when we found the broken wood and blown-up mid-wall fairly across the shaft, preventing our further progress downwards. While we were debating what should be or could be done, in the silence of the shaft we heard groans of agony and loud moans coming up from the workings below. Our hearts were sorrowful that we could no further go to the help of our poor unfortunate fellow-workmen. We shouted to them that help was near, that assistance was coming, and we listened for a reply, but there came naught else but a renewal of the agonising groans. We could do no more but signal to be drawn up to the surface once more, in order to consult with the mining engineers who, we knew, must by this time have been attracted to the pit, as to the best mode of getting through the obstruction and reaching some of the poor fellows whom we were now certain yet remained alive at the bottom of the pit. Thus so far for No. 3 pit. But it is necessary to return to No. 2. As has already been remarked , none of the firemasters or inspectors have come up alive from this mine; and it is only known by inference that from four o'clock in the morning to the time the explosion took place all went well. One man, however, who made a very narrow escape with his life - to wit, John Sharp, a roadsman, gives a narrative of what occurred under his own observation in this working . He says :—" I went down into No. 2 pit at six o'clock, according to my usual practice. Then apparently everything was all right, and along with my mates I continued working till twenty minutes to nine o'clock, having no suspicion that anything was wrong. Indeed,I had been going all through the levels, seeing that the roads were all right, and having satisfied myself of this, was returning at the time mentioned to the bottom of the shaft, for the purpose of ascending to get my breakfast. I had reached within eighty or ninety yards of the pit bottom, when I felt an awful blast coming from behind, like a storm, which intermediately returned back on my face. Our lamps were all blown out, and I knew then that the pit had blasted though I heard no noise. It may be well to state here that the reason why the blast descended with the dip of the seam and found escape by the shaft of No 3 poit instead of running upwards as one might naturally expect towards No 2 pit, is, as explained by the colliers themselves, that the flame invariably goes against the air, free ventilation being mainly provided from No 3 pit. It followed therefore, the the flame of the explosion, according to this theory, should run down the dip. Continuing his narrative, Sharp said —"I ran for No.1 communication but there felt the after-damp very bad, and then groped my way as far as the underground enginehouse. Here through the darkness I heard the oversman's voice shouting to go directly to the big dook and open the door. This I attempted to do, but got no farther than twenty or thirty yards when I was all but overpowered by the choke-damp. Turning and crawling on hands and knees, I without great reached the bottom. which was between twenty and thirty yards distant. I had been in the south 'dook,' and on reaching the pit bottom I found nearly all the men who had been in the north 'dook' with their lamps lit standing there. I crawled over the steam pipe and on to the top of the cage. Owing to the breaking of the slides in the shaft and other obstructions, the cage had not been able to run up. The men from the north side asked me to ascend the shaft and endeavour to clear it. I rang the bell, the cage slowly ascended, and we came across some broken timbers and slides, and the needle which supported the steam pipes in the shaft. These I kicked out of the way of the cage , and by-and-by I was hauled to the top very much exhausted. The cage was sent down for the north men , who were at the bottom of the pit. I crawled home and it was two or three hours before I fairly recovered from the effects of the damp." Another lad, named Wm. Kirkland, who has been much burned about the face, head, and hands, says : —"I was working on the north side , running the chains"- which means that he was employed in collecting hutches from different miners, and chaining them to one another in one train to bring them to the pit mouth — "I was thirty yards from the pit mouth when I heard a noise, and looked round, I saw a great mass of flame rolling along the level. My mate, Thomas Martin, shouted to me to 'clap,' that is to fall on my face on the floor of the gallery, which I did, but not before the flame had struck me about the face and hands. I remembered that my brother Robert was working in the south 'dook. ' and I staggered up to try and get to him, but could not advance. My mate cried to me to make for the cage, and I crawled to the pit mouth as quickly as I could, and was taken to the surface. It will thus be seen from the narratives of these two men that the explosion was as unexpected in No. 2 pit as it was in No. 3 ; that it came upon them without the slightest warning, and that for some reason or other, which further investigation may bring out, the fire-damp is well as the flame was more severe on the south side than it was in the north " dook," for nearly if not all the men employed in the latter working escaped to the pit-mouth, and were, some with more or less injury, drawn to the top. So far as can be learned, not a single soul who was in the south side of the pit escaped, and there is now no hope that any have survived. It is only consistent with the character of miners to say that the moment the extent of the calamity was realised, there were many willing hands ready to embark on the dangerous enterprise of a rescue. Indeed, the question seemed to be who would have the honour of descending first. As the explosion appeared to have expended itself in the direction of No. 3 pit, it was deemed wise that a supreme effort should be made to get at the entombed men by the clear shaft of No. 2. First of all, it was necessary that ventilation should in some degree be restored and for this purpose a stream of water was poured down the shaft. An exploring party was organised , and they descended , but the choke-damp was so powerfully felt that they had to return without result. By and by Sir James Gilchrist, manager for Mr John Watson's colliery, appeared on the scene. He had been at one time employed in the High Blantyre Colliery, and knew intimately all the workings, so that naturally he was allowed to take the leadership in the rescue party, which consisted, besides himself, of Mr Thomson. Mr M'Farlane of Allington Colliery, Mr Robeson , assistant inspector of mines , and Mr Simpson , manager of the Clyde Coal Company. Although, when they descended , the choke-damp was almost overpowering , they persevered, and got to the bottom , the after-damp which had followed the last of the rescued colliers from the "north dook" to near the pit month having by this time been all cleared away from the shaft. The gallant band of explorers when they reached the mouth of the workings, called lustily, but no reply came to their cries, and the subtle gas beginning to roll outwards again, they were forced to beat a retreat, but not before one of their number was all but overcome . Indeed, when they ascended to the surface, this gentleman had to be attended to by Dr Lennox, and restored with ammonia. Another attempt was made to penetrate to the workings , and this time they succeeded in securing one body, which was slowly drawn to the surface. Again and again they descended, and on each successive journey one lifeless or apparently dead collier was secured ; but at last, about 3 o'clock , the choke-damp got so bad that they were compelled to give up the effort, and then only when assured in their own minds that every person who had been in No. 2 Pit had then succumbed. Mr M'Farlane described the scene in the workings , so far as they could, penetrate , as something terrible. One man he saw lying against a stoop with his arm broken and the shoulder-bone sticking out , while his face was burnt to a cinder. Another had fallen on the road on his back, his clothing torn, and his body charred. Still another was bruised and bleeding, but lifeless, pitched against the side of the working. Two men, an ostler and a pulley drawer, had evidently been sitting together , having a smoke and a chat, when the explosion occurred. Their death had been instantaneous , one being thrown a mangled corpse to one side , and the other in the opposite direction; and so on through a fearful list. Joseph Gilmour , the oversman , who had spoken to Sharp when the latter attempted to restore ventilation by creeping to the 'big dook" door , was found, near the engineroom with his leg broken. He had thus been unable to crawl with the others in the "North Dook" to the pit month, and had been killed by the after damp. About three o'clock , after some fourteen bodies had been recovered, the " choke-damp" became so great in No. 2 pit that it was determined to close this pit altogether, and direct the main efforts to the restoration of ventilation in No. 3 pit, and, if possible, attempt the rescue of any men who might be alive there. Accordingly , all the rescue parties proceeded to the latter pit-head. Here, it will be remembered, M'Call and his party had not intermitted their efforts to get to the bottom. By three o'clock they had so far cleared the down shaft as to have reached within 24 fathoms of the workings. Here, however , they found their further downward progress thoroughly obstructed by the wreckage of the mid-wall and also of the slides, and it became necessary to ascend the shaft for the purpose of obtaining saws, axes, and other instruments for clearing the wreckage, while the bellgear had still farther to be repaired. Gang after gang of noble and brave men descended in the " kettle," and with insecure footing worked with a heroism worthy of all praise. Now and again the choke damp coming up in fitful gusts, and almost overpowering them. They had cleared a considerable distance, and had almost reached the bottom when I left the scene of operations. Latterly, however, the cries of the men below , which had been heard earlier in the day, when the cage first descended with the "kettle" had ceased, and the gravest fears were entertained that the poor fellows had either succumbed to the choke damp, or found relief from their agony in insensibility. No definite explanation is yet forthcoming as to the cause of the accident , but a shrewd guess has been given by one of the underground managers. He supposes that a party of miners were working in No. 2 pit, about half-way between No. 1 and No. 3 , taking out the standard pillars which support the roof. During this process he thinks a fall of a roof must have taken place, and that a rush of explosive gas followed from some crevice. It is understood that the removal of the roofs should invariably be accomplished by the light of Davy safety lamps, but it may have happened that on this occasion some naked lamps were employed, and if so an explosion was sure to ensue. Mr Ralph Moore , Inspector of Mines for the West of Scotland, was present at the colliery during the day, and no doubt he will make a rigid inquiry into the cause of the accident. It is agreed on all hands that the explosion was something like a salvo of artillery, succeeded by a rumbling noise like that of distant thunder. The report was heard over a wide district, of country, and gave warning to only too many households of an event which was to prove so disastrous and create so many desolate hearths. 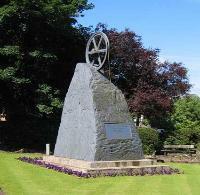 In a very short time streams of women and children were seen issuing from the "rows" adjacent to the colliery, while from the village of High Blantyre and further afield groups of men and maidens, old women and youths, many but scantily attired, and all with blanched, scared faces, came with hurrying footsteps towards the pits. According to their knowledge of the whereabouts of their friends and relations, these groups and streams wended their sorrowful way to No. 2 or No. 3 pits, surrounded the shafts , and inquired for fathers and brothers, for sons and husbands. Though those at the pithead assumed a cheerfulness which found but a hollow echo in their hearts,and bade the anxious petitioners wait with patient expectation of the happy arrival in life of those they held dear, hope seemed from the first to be crushed within these poor souls. Often piercing shrieks were heard of—"Oh my puir faither, let me hae my faither;" "My man, my bonnie man, bring him to me," "My dear wee laddies, what am I tae dae withoot them." "My John, will ye no bring John," and so on. Strong men shed tears or wrung their hands in silent agony. Others looked round silent, with faces bearing traces of internal agony. Women there were too, whose looks of stolid misery betrayed inexpressible emotion . In the course of the early hours of the afternoon the harrowing spectacle acquired its most mournful and melancholy aspect, for then the efforts of the exploring parties in No. 2 pit were beginning to have some result. The tow rope moved, and in slow succession the cage was drawn to the surface, bearing as its freight the mangled or bruised remains of some poor wretch, who but a, few hours before had descended to his hard task in the pride of life and fulness of hope. Then sharp breathing and excited groups pressed round the shaft mouth, anxious to be relieved from suspense, yet fearful that their worse anticipations would be realised , and when one after another of the limp, blackened, and muddy corpses, covered by a coarse blanket for decency's sake was borne from the cage to the weigh house, a hundred yards distant, it was painful to hear the shriek of agonised recognition from wife or mother in the crowd. The wright's shop was converted into a morgue, and there the bodies were conveyed , and laid upon straw for identification. There, too, were a number of medical men , with every appliance known to science, ready to use the utmost efforts for the recovery of any who might still exhibit signs of life. But only in one case could even the faintest trace of a struggling spirit be recognised, the case of a man named Burns, but every effort made to bring him back to life failed. Throughout the afternoon small groups assembled round the offices, and hung about the plain hearse or straw-covered carts provided for the removal of the dead, anxious to learn if friends had been recovered or had been brought to the surface, and there, despite rain and hail, they waited - a pitiful scene. The few bodies conveyed to the morgue were dressed as decently as the circumstances would permit, and then handed over to the care of friends. It is to be noted that the bodies recovered almost all present marks of injury by burning. Some were contorted in the most dreadful manner , with the faces as black as the coal which they had been excavating. Others were torn and bruised, with dark crimson streams of blood trickling through their mud-covered and dust-begrimed clothes. A few had shreds of their pit suits torn away, while one or two were battered and bruised in a shocking manner. The small remnant who apparently had succumbed to the choke-damp wore a peaceful expression as if in sleep, and these when found were discovered lying on their faces in the levels, as if they had been making haste to the pit bottom when overtaken by the deadly, suffocating gas. Into No. 3 pit 107 men went down to work, but, as is often the case in such collieries, the names of all were not known, because parties of two and three often join together. and the whole result of their labour is credited to one man, whose name alone appears in the books of the justiceman at the pithead. The following is a complete list of the men known in this way to the overseer :- John Gold, William Roberts, James Irvine, John Lafferty, George Nisbet, John Hamilton, J. Cosgrove (boy), another boy, name unknown; John Crawford, James Gold and boy, William Steen, Thomas Robertson , Patrick Dolan, John Murphy, J. Murphy (boy), Thomas M'Donald, John Campbell and boy, Charles Toner, Thomas Baxter, John Dollan, William Reid and boy, William Woodhouse , James M'Gharry, James Brannagan, John Kelly, William Freckleton, John Freckleton, Edward Smith, J. Smith, Con O'DonneIl, with a mate, name unknown; James Smith, George Semple, John Stark, John Crow, William Boyle, James Wilson and son, Francis Murphy, John O'Brien and boy, James Snedden, with two sons and another boy; John Kennie, jun., and boy; John M'LauchIan, Hugh Wilson, with two sons; John Welsh, James Welsh, and Robert Welsh ; James M'Kinnon, Joseph Miller and Andrew Miller, Thomas Halliday, Francis Wilson, John Steen and son, John Crop, John Burns, John Connolly, Matthew Gemmell , J. Gemmell, James Lang and son-in-law, name unknown; Wm. Muir, James Allan, Robert Halliday, with his two stepsons, two brothers named Stewart, John M'Fadzen, John Gardner, John Caveny and his brother James Caveny, John M'Culloch and his mate name unknown; Francis Welsh, John Muir, Gilbert Murray, two lads named M'Killop, Thomas Ramsay, Hugh Larkins, James Cosgrove, Alexander M'Call, John Little, John Pickering. In addition to these there were four drivers, two roadsmen, and two bottomers. It is known that 126 men and boys went down No. 2 Pit between four and six o'clock in the morning. Appended are the names of those known, the remainder being accounted for in the same manner as in the case of No. 3 Pit:— Wm. Campbell, John M'Farlane, with three of a gang, names unknown; Patrick Kelly and boy, Thomas White and boy, James Ray, James Brodie, Thomas Murdoch, James Clyde and two sons, John Dobie, Thomas Dobie, Andrew Morrison, John Watson, John Moir and son, Peter Merry, Edward Moir, Robert Russel, Wm. Speirs and John Speirs (brothers), James Kemp; George Speirs, sen.; Geo. Speirs, jun, Chas. M'Quowen, Jn. Cunninghame, Thos. Hendry, John Hendry (brothers),Hector Stewart, Robert Heron, Richard Ross, J. White and boy, John O'Neil, Alex. Revie (senior), Alex. Revie (junior), Edward M'Callum, Barney Murray, Gilbert M'lntyre, John Park, James Sharp, Nicol Kyle, Andrew Robertson, Moses Roberts, Patrick M'Cafferty, John Sharp (alias James Burns), David Martin, James Liddell, Thomas Black, James Mackay, Hugh M'Gill, James Russell, Andrew Kirkwood and his son, John Cox, Peter Callan and four of a gang (names unknown), James Hastie, James Wether, Neil Ward, John Mackay, Owen Martin and mate (name unknown ), John Russell, Hugh Tonnor, Michael Cairns and mate (name unknown), Robert Kirkland, John Hill, William Hill, Hugh Brown, John Nelson and mate, name unknown ; Duncan M'Millan and three of a gang names unknown, Geo. Watson, Geo.Watt, Patk. M'Cuscar, Michl. M'Cuscar, Edward Docherty, Wm. Kirkland, Thos. Martin, John Sharp, Alex. Wood. Wm. Welsh, sen., Wm. Welsh, jun., Wm. Black, Alex. Watt, Robert M'Adam, Jas. Wright, John Wright, Thos. Gracie. The following are the names of the dead brought to the surface from No. 2 pit. William Bolton, Auchinraith, Hamilton Road, 13 years. Patrick Burns, Bruce's Land, Larkfield, 34 years. Robert Henry, 11 Larkfield, Barronhill, 16 years. Joseph Gilmour, jun., 13 years, son of foregoing. James Macmillan, 16 Larkfield, 30 years, married. Robert Wardrop, sen., Dixon Row, 36 years, married. William Campbell, Smith's Land, Kirkton, 34 years, married. Alex. Miller, 14 Priestfield Terrace, 18 years. Archibald Lang, Aitkenheads, Kirkton, married, 25 years. The following are the names of those rescued - John Hill, Wm Hill, Hugh Brown. John Nelson, Geo. Watson, Geo. Watt, Patrick M'Guscor, Michael M'Cuscor, Edward Docherty. None of them are injured. Duncan Macmillan, slightly injured on face. William Kirkland, burned face and hands. Alexander Wood, do., with burns. William Welsh, senior, and William Welsh, junior, burned. Before attempting to describe this unprecedented calamity, it may be well to state that there are a great many pits in the neighbourhood where it happened, the Hamilton coalfields being well known for their richness. High Blantyre lies a few miles to the north-west of Hamilton, and distant from Glasgow about nine miles. the pits in which the accident occurred , which are situated a short distance from the village, are comparatively new, No. 2 having been in operation since 1873, while No. 3 has only been worked for twelve months. They lie east and west of each other , the two shafts being separated by 750 yards. It is right at the outset to state that both pits bore a very high reputation amongst the miners themselves as being exceedingly well ventilated , Messrs Dixon having expended considerable sum's of money in introducing all the latest improvements. One of the men who has worked in the colliery for a considerable time, but who, curiously enough, arranged to commence operations in another pit yesterday, gave it as his opinion that they were as well ventilated mines as could be found in the district. The principal portion of the fresh air introduced is sent down No. 3 shaft. At the bottom the current branches into two volumes—one going along the south and west sides of the workings, and the other along the north and east. This, again, is met by the air from No. 2 shaft, and, after forming a junction , it escapes by means of an upcast shaft in the vicinity of No. 2 pit. This upcast is a brick structure, ten feet in diameter. There are three furnaces in connection with it; and when the mine was last seen by the Government Inspector, he certified that they produce a draught equal to 300,000 cubic feet per minute, No. 3 pit is sunk to the depth of 155 fathoms ; while No. 2 goes down only 130 fathoms. The north level is 350 yards long, and the "dook" on the north side 600 yards , while the shortest air course between the two shafts is 750 yards. the level on the south side is 750 yards long, the communication between the two mines in that point being 600 yards. In No. 3 the workings extend 300 yards towards the south, and an equal, distance towards the north. It will thus been seen that the "dip" is at No. 3 pit, and that the workings rise towards No. 2. Both pits, it may be stated, were worked on what is known as the "stoop and room" system. Having said this much about the position of the workings, the question arises, "How did the accident occur" It is impossible to answer that question with certainty, but to whatever it may be attributed, the cause was that fearful enemy of the miner - fire-damp. Scotch mining operations have hitherto been unusually exempt from serious accidents attributed to this source , owing partly to the comparatively limited depth and extent of the workings, which admit of better ventilation than can be readily attained in the more extensive English mines, and partly also to the fact that our coal does not contain nearly so much gas as is found in many south country seams. The present occurrence, however, presents a lamentable exception to what has hitherto seemed a general rule. The miners started work as usual at six o'clock yesterday morning, the operation of lowering the 233 men occupying, of course, some little time, as only four or five can be comfortably accommodated in the cage at one time. So far as can be ascertained , 126 men went down No. 2 shaft and 107 down No. 3. In both pits only the splint coal, which is in the lowest seam, was being worked. As is well known, it is necessary that an official named the " fireman" should go over the workings every morning to see that all is right before any of the miners are allowed to descend; and there is no doubt that this was done yesterday morning. According to the statement of the fireman, he went over the mine very carefully, and found no trace of anything to excite suspicion that the pit was charged with fire-damp. Such being the case, work, as already stated, was commenced at the usual hour of six o'clock. By seven the whole of the men were down, and apparently for nearly two hours all went well, a state of matters which would seem to support the account given by the fireman of the mine as he had found it. A comparatively small number of the men who went down No. 2 pit were engaged at the north face, the principal working lay rather to the south-west; and there seems no reason, to doubt, that it was at that point the explosion occurred. The part of the mine in question is described in technical language as "unused," but it is necessary to couple this with the explanation that the men were working backwards, taking with them the "stoops " or supports as they came along. Whether the theory be correct or not, it is supposed that , in consequence of the taking away of these supports, a considerable portion of the roof must have fallen in, which necessarily forced outwards the air from the furthest point of the unused portion. the air, it is believed, was largely charged with fire-damp, and as soon as it came in contact with the lampS which the miners carried in their caps it ignited and caused a fearful explosion. The dull rumbling sound heard above ground indicated at once that something was wrong ; and if there could have been any doubt on the matter it must have been soon dispelled by the tremendous volume of name which was vomited forth from No. 3 shaft, smashing completely the cage and the woodwork, and injuring severely Mr Watson, the manager, and some joiners who were engaged in making repairs about the mouth of the pit. Two of these men , it is said, were actually blown a distance of twenty feet from the shaft; but this only conveys a faint idea of the violence of the explosion, for it must be remembered that the flame - granting that the above supposition as to the locality of the explosion is correct - must have travelled over 2800 foot before finding egress by the mouth of No. 3 shaft. Following upon this volume of fire , which is said to have carried with it a quantity of coal dust that darkened the air in the vicinity for a few minutes, there came a rumbling noise in the shaft,indicating only too plainly that the bratticing had been damaged and that a portion of the sides had fallen in. When the results of the disaster came to be examined it was found impossible to reach the bottom by either the up or the down shaft of No. 3 pit in consequence of the wall between having been partially blown down. At No, 2 shaft less damage had been done , from the circumstance that fire-damp explosions always travel against the current of air ; and a few minutes after the accident fifteen men, who had been working at the north face , were brought in safety to the surface. Happening, as the explosion, did, shortly before nine o'clock, there were very few of the heads of departments on the ground; and for a little while operations , with a view to examine the pit, had to be conducted under the charge of some of the miners. The news of the catastrophe , however , spread rapidly; telegrams were despatched to Hamilton , Bothwell, etc., for assistance, and in a short time several engineers and a number of medical men reached the scene of the accident. From High Blantyre and Stonefield , the female relatives of the men in the pit came rushing almost frantic with alarm and for an hour or two the group of people who crowded round the pit presented as painful a spectacle as could well be imagined. Some of the women went into fits of hysteria during which they persistently shouted the names of husband, son, brother, or some other relative. While this terrible scene of excitement was to be witnessed, among the bystanders at the pit mouth, the few men who had assembled were too deeply engaged in considering what should be done to show any outward signs of distress. Their first thought was to organise an exploring party to go down and ascertain the extent of the disaster, and whether any of the men in the pit who might have been rendered insensible but not killed could be assisted and brought to the surface. It is a compliment which miners well deserve to have paid them, to say that in all cases of a like nature there is no lack of willing volunteers ready to risk any danger if their services can be of any avail. In a comparatively short time , accordingly, an exploring party was got together and sent down ; but they returned to the surface with a sad tale. At a short distance from the bottom of the pit they found two or three men lying dead, and on going further into the workings they discovered more corpses, but not a sign of the presence of any living being. The air was found to be so foul that they could not remain any length of time at the bottom, and picking up one or two of the bodies, they signalled to be drawn up. By this time the miners from other pits had gathered, and a second exploring party went down, only, however , to return with the same sad story, that there seemed no hope of any of the men who were engaged in No. 2 pit being found alive. They had collected, one or two more bodies and these they brought with them to the surface. This second party was succeeded by a third , and so on till the choke-damp got so bad that several of the explorers, when they were brought to the surface , fainted and became very ill. To purify the air in the pit a stream of water was now poured down the shaft, but this seemed to have comparatively little effect. Attempts were, however , made again and again to descend, and Mr Simpson, the manager of one of the Clyde Coal Company's pits, when lie reached the scene of the disaster , volunteered to go down along with some of the miners. This party remained below for some time ; but so far as saving life was concerned , their efforts, too, proved fruitless. One of the party related a touching incident. Two of the men in the pit where the accident occurred - a stripper and a drawer - were very great friends, and, whenever opportunity occurred, were together. In death they were not divided; for, from the position in which their bodies were found,they had evidently been talking to each other when the explosion occurred, and the drawer's horse had fallen down between them. About three o'clock in the afternoon the foul air got so bad, and came so close up to the bottom of the shaft, that operations had to be entirely suspended, so that from that hour all communication with the interior of the pit was cut off. The first party of explorers that went down No. 3 pit only managed to descend some 70 fathoms ; but the second relay were more successful, as they managed by degrees to cut their way through the broken woodwork, until they got within some 20 or 25 fathoms of the bottom. At that depth however , progress was almost stopped , the men being unable to force their way with any degree of rapidity through the large quantity of wreck which had there accumulated. After a while, they brought to the surface the only cheering intelligence of the day. They had distinctly heard several voices of imprisoned men shouting for help. Unfortunately no help could be given; the report had, however, a salutary effect on the band of gallant fellows who waited at the pithead ready to take their turn in rendering whatever assistance lay in their power. It seemed to leave room for hope that their labours might, after all, be rewarded with some success, and that , in addition to recovering the bodies of those killed, they might be enabled to set free others who had escaped the effects of the explosion and survived the horrors of the choke-damp. The attempts to reach the bottom were accordingly renewed with a will, but the difficulties in the way were not to be easily overcome. The cage had been rendered useless, owing to the destruction of the bratticing of the shaft, and the sinking "kettle "—a large iron bucket— had to be put in requisition for lowering the explorers. Not more than three men could get into the "kettle "at a time, and ultimately the explorers found themselves unable to make much headway. They still heard the shouts of the poor fellows below ; but, in order to avoid raising hopes which might never be realised, they did not give the prisoners any encouragement by replying. This may seem rather questionable policy; but it was agreed amongst the men that until they saw some surer prospect of gaining access to the mine it would be needless to excite the poor fellows by raising vain hopes. How many were alive it was utterly impossible to say ; but some of the explorers estimated, from the sounds they heard, that there seemed to be at least a dozen of men shouting. This must, of course, be taken as a mere surmise; the number might be smaller; but, on the other hand — and it is to be hoped such will be the case—it might be much larger. By noon the whole of the engineers and practical men connected with Messrs Dixon's mines had assembled at the scene of the disaster, and they were accompanied by Mr Ralph Moore, the Government Inspector of Mines, who took an active interest in directing the exploring parties. A special train also brought Drs Marshall, Lennox, London, Robertson, and Crawford, of Hamilton; Drs Grant and Downie, BIantyre ; and Dr Gouff , Bothwell; but their services unfortunately were not much required except in dressing the injuries of the men who had been burned at No. 3 shaft. the bodies which had been taken out of No. 2 pit were placed in a building connected with the colliery office. Some of them were terribly mutilated and disfigured. Wm. Campbell had his skull fractured to such an extent that a portion of the brains protruded; while several others were very much cut and bruised. In some cases the clothes were almost completely torn or burned off; and the skin, when touched, came away with the hand. The appearance of the dead was considered to leave no doubt that the explosion had been most violent, though in all probability it will be found that the greater number have lost their lives by the choke-damp. Later on in the evening the colliery was visited by vast crowds of people, many miners coming from a distance when they heard of the accident. The wives and relations of the unfortunate men in the pit were to be found hanging about in groups in the vicinity , and there were not wanting kind friends who tried to cheer them up by convoying reports that men had been hoard shouting below. One young girl was conspicuous amongst all the others by the excess of her grief. She had a sweetheart in the pit and she went about crying that she would, be satisfied if they only showed her Archie, even though he were dead. Poor thing, her wish could not be gratified , for Archie , whether alive or dead, had not been brought to the surface. In some instances there were as many as three members of one family in the pits, while in numerous cases there are two - father and son. It is impossible to estimate at the present stage the number of widows and orphans left destitute by the catastrophe , but there is too much reason to fear that it must be very large. In the majority of cases these people are ill provided for , and the disaster must be attended by a large amount of suffering and privation. The Caledonian Railway Company, it may be mentioned, kept a train of first-class carriages and an engine at the pits during the whole of the day and all night, to be ready to convey to the hospital in Glasgow any men who might be brought to the surface alive. At night the aspect of affairs at the pit-heads was exceedingly melancholy. 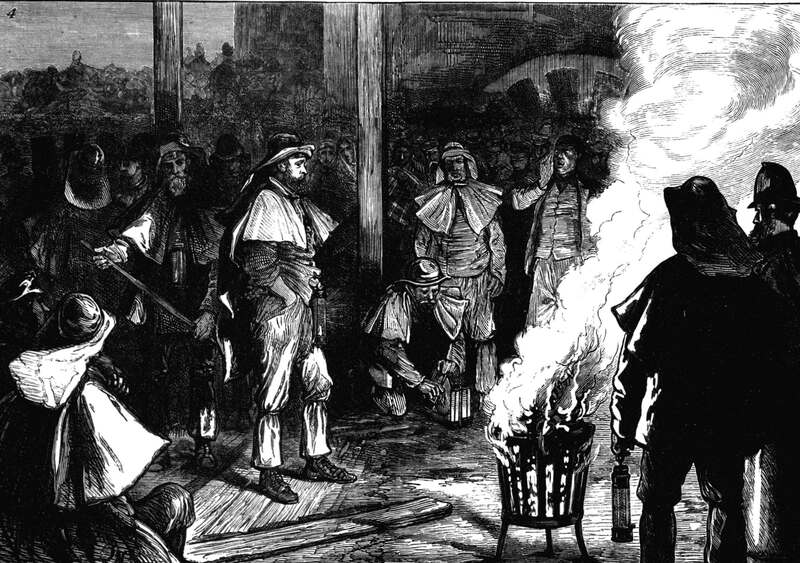 Great fires were kept burning, round which stood eager crowds, while the brave band of miners, who acted as explorers, pursued without intermission their painful task of trying to reach their unfortunate comrades. The whole affair will doubtless form the subject of a most searching inquiry. Without attempting to throw blame on any one, the disaster should appeal strongly to the miners themselves, and one of the questions they should seriously consider is, whether it is wise to persist in using naked lamps. There is no question that a considerable number, if not the majority, of the lights used in No. 2 pit yesterday, were of this description. Several of the men are known to have had the Davy safety lamp; and had its use been universal throughout the mine , the probability is that no such disaster would have had to be recorded. HAMILTON- Midnight. The joyful intelligence has just reached the surface that at least four other lives have been rescued in this terrible catastrophe. During the earlier part of the evening vigorous efforts were made to reach the sufferers in No. 3 pit, who had been heard calling for assistance. The scene at the pit-head was such as to leave a deep impression upon the mind of those who witnessed it. On the moon rising she revealed with the utmost distinctness everything in the neighbourhood of the mine. the fires in the great iron braziers threw a ruddy gleam over their immediate surroundings, over grimly silent men, whose set faces bespoke a determination to proceed on the mission of mercy. On every hand were crowds eager-eyed but also silent, except for the groans which escaped the lips of the women. The search parties, relieved at brief intervals, were busily at work in the blocked shaft. When a batch of those who had been relieved made their appearance , the beads of sweat on their faces and the knotted veins of their hands told of the severity of their exertions. The idea had occurred at a comparatively early hour to attempt the opening of a communication with the entombed men by means of No. 2 pit. As soon as the idea was mooted , hundreds of volunteers were ready to descend , and an exploring party was speedily organised. On reaching the bottom of the shaft they were driven back repeatedly by choke damp, but they boldly returned to the task they had set themselves to, and at last succeeded in forcing their way into the gallery which leads to No. 3 pit. The intelligence that such was the case elicited a cheer from the crowd gathered at the shaft. During the hour which followed , the excitement increased in intensity, and despite a pitiless rain, driven by a strong wind, the number of persons continued to gather at the scene of the explosion. The watchers were rewarded about 11 o'clock, by which time the rain had ceased, and the moon was shining brightly, by the information that a few more lives had been snatched from the tomb. Among the leaders of the party at the time of this pleasing discovery we may mention the following:- Mr Charles Thomson, one of the partners ; Mr Frederick Duncan , general manager ; Mr Gilchrist, late manager in Calder ; Mr Robt. Thomson, Mr John Smith , civil mining engineer, Calder ; Mr Fergus, manager, Carfin. The members of the party extended in a line within calling distance along the whole extent of the workings between the two pits. Of course the reason of this arrangement is obvious, for if the deadly damp should overtake any section of the party, these would be able to make the fact known to their comrades. The news in the vague form in which it was first received was considered too good to be true, but presently it obtained confirmation from a member of the exploring party, who on coming from the cage stated that three men and a boy had been picked from the ruins alive. It is impossible to describe the extraordinary effect this intelligence produced upon the mass of persons surrounding the pit-mouth. The mental alternations between hope and fear were plainly depicted on their features, and owing to the fact that the names of the rescued were unknown, relatives were kept in a state of suspense for a considerable period. With the exception of Drs Grant and Crawford, the whole of the medical men - and amongst those were Drs Robertson, London, Marshall, Downie, and Goff - had left the scene of the explosion. On hearing that several of the miners were found alive, Dr Grant descended with restoratives, while Dr Crawford remained above ground to superintend their reception . The glad news was at once carried to the adjoining houses, and from these an abundant supply of blankets was hurriedly conveyed to the pit. Fain would the crowd have pressed to the pit-head , but that would have prevented the execution of the rescuers' plans. Down in the pit the spectacle which presented itself was a somewhat sickening one, for along the sides of the gallery were long strings of dead bodies , which were to be left there until those who were alive were taken out. The rescued were found to be - M'Donald , Charles Garner, William Gemmel, and a boy. They were very much bruised, having been dashed against the wall of No. 3 pit. Towards midnight they complained of cold, and they were removed to a stable, where they lay for some time almost hidden amongst wrappings. During the first half hour they all showed favourable symptoms, except the boy, who gradually grew worse. HAMILTON, one o'clock. - With great tenderness those who had been saved were carried to the shaft, but the boy died on the way. The others were raised to the surface amid the cheers of the crowd about half-an-hour since. Macdonald and Gemmell are in a fair condition, but Gardner lies in a very low state. 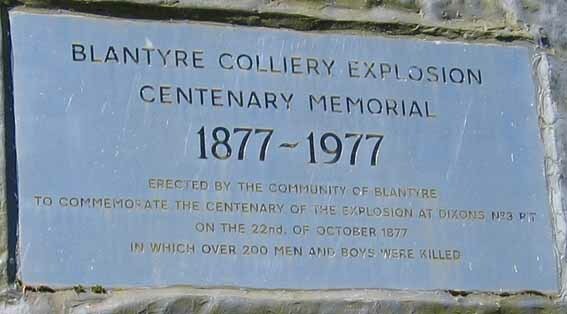 THE GREAT COLLIERY ACCIDENT AT HIGH BLANTYRE. High Blantyre, Tuesday Morning.- Nothing has yet occurred to mitigate in the slightest degree the overwhelming aspect of the catastrophe which has overtaken the village of High Blantyre. The gallant exertions of the bands of heroic men who braved the stifling pit in the hope of saving some of their comrades have not so far, been rewarded with any further success and instead of brightening, the prospect looks, if possible blacker than ever. After midnight the conviction seemed gradually to force itself upon the sorrowing crowd about the pithead as was but too plainly written on the faces of many a wife and sister and mother, that all hope of again seeing alive the bread-winners of their households must be for ever relinquished. Only one last wish remained to them - that the bodies might be speedily recovered, so that at least they might have the melancholy satisfaction of wailing over the dead and giving them Christian burial. It is feared , however, that in many cases even this sad consolation must be for some time withheld , and that the keen anguish and intense excitement which have prevailed in the district since yesterday morning must remain for a day or two unabated ; for only other four out of the many bodies which lie entombed in the workings had been recovered and brought to bank when the managers of the mine were compelled , out of consideration for the lives of the self-forgetting explorers, to withdraw the whole or them from the mine until something should have been done to render their operations moderately safe. 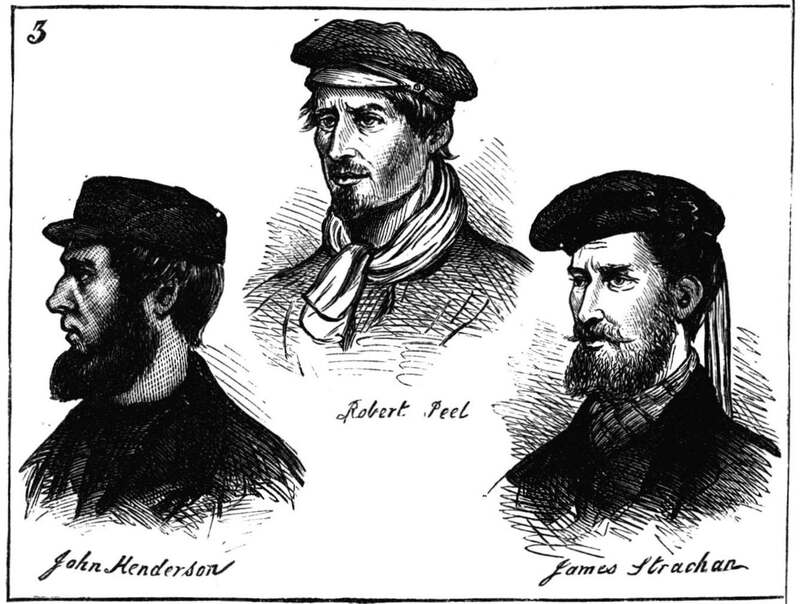 Harking back upon last night's proceedings, it may be mentioned that the three men —Macdonald, Gainer, and Gemmell — who were got out alive at an early hour this morning had been found some little time before by two of the search party in one of the air courses , about six fathoms from the bottom of the shaft of No. 3 pit, or, as the men call it, " no. 3 bottom." near them was lying a boy, whose name it afterwards appeared was James Richardson. Their faces were all turned to the shaft, towards which they had been running when the deadly choke damp overtook them. Gainer was quite insensible, the only indication of life which the explorers could make out by the flickering glimmer of their lamps being a certain spasmodic pouting of the lips, through which a feeble moan occasionally escaped. Otherwise his features were rigid and the eyes fixed and death-like. The boy was also seen to move his lips; but, according to one of the party who found him , on their attempting to give him a little water, he almost immediately expired. Gemmell, although evidently suffering the most intense pain, was able to talk a little, and, it is said, received his rescuers with a devout sense of gratitude, which found expression in the words, "Oh, mates, I was wearying for you." Macdonald when roused from the lethargy into which he had sunk, complained of cold — a thing which is by no means looked upon as an unfavourable symptom in connection with such accidents. It has already been stated how Dr Grant gallantly descended, the mine about half-past eleven o'clock to attend to the sufferers. The crowds of dejected men and women round the pit were then on tip-toe of expectation ; for the names of the three survivors reported were at that time unknown , and many hoped against hope that among them might be the missing one they fondly longed for. The minutes passed slowly on, and seemed tedious hours to the eager watchers. At length the three bells were heard from the pit bottom , and a hush of expectancy pervaded the crowd as the ascending cage neared the top. Faces were eagerly thrust forward, and great was the disappointment when it was found that it was only one of the explorers who had returned to the top for necessaries. The succeeding period of suspense was short but painful. Women, whose nerves had again become unstrung, sobbed out their grief, and hearts of sterner stuff than theirs found it difficult to suppress their emotion. But at last the rope again began to move, though more slowly than before, and , as the cage emerged into sight, several of the men standing near the rail shouted , " They are coming!" to which the bystanders responded with a faint cheer. Macdonald was the first sent up. Gainer the second, and Gemmell last; and each in turn was gently carried on a litter to the miner's shop, where beds of straw had been hastily prepared for their reception. Great fires blazed at each end , and everything was done to alleviate the sufferings of the poor fellows as much as possible. The most impassive spectator could not have looked unmoved on these three men. Their faces were black and shining— not begrimed with dust , as in an ordinary working day, but evidently scorched by the flame of the explosion ; and their aspect was rendered some-what hideous by a white foam which hung around their months. Beneath the black surface was the raw flesh, the fire having evidently destroyed the skin over the whole visage. Macdonald's face and his arms to the elbow were badly burned; the other two had fared even worse. Gainer having several torturing injuries upon the breast and back. Macdonald, while under treatment, gasped for water, declaring his throat was burning. A cupful was speedily brought but the doctor, thinking it too much for the patient to take at once, directed the attendant to withdraw it when about one-half had been drunk. Macdonald , however, with a convulsive clutch, gripped the cup, and would not relinquish his hold until the last drop had been drained. Then, with a sigh of relief, he sank back upon his couch. Gemmell , while they were dressing his wounds, maintained the same cheerful manner that he had shown when discovered in the mine, though his frame quivered at every touch of those about him. While one held a little whisky and water to his lips, he asked for tea, and took a large draught from a cup of that beverage which was offered to him, with the remark, "Man, that's fine." He apologised to ; the doctor for being so wet, " for, " said he, "I gropit lang in the bottom for a wee drop o' water." All three men had their clothes cut off and their bodies swathed in fine flannel. After these rescued miners had been brought to bank, the crowd at the pit-head perceptibly diminished. Many retired, not to sleep, but at least to pass the weary night hours in-doors ; others, however, there were whose anxiety would not suffer them to withdraw , and these wandered about among the wreckage like persons demented. Great compassion was felt for the numerous women who, in some cases slightly clad, and in one or two instances carrying very young babies , braved the keen night wind in the hope that, perchance, some scrap of news might be brought up the shaft. Though cold, the night, fortunately, was otherwise fine, and the clear full moon lighted up labyrinthine paths, which in the dark it would have been difficult , if ; not dangerous, to traverse. Round a big fire which burned hard by the pit-head clustered squads of men waiting their turn to descend ; and these of course found ample matter for conversation in the stirring events through which they were passing. From midnight on to about five o'clock this morning men were constantly passing up and down the pit, and although the officials were by no means forward to communicate information as to what was transpiring below, it by-and-by became evident that preparations were being made for sending up the bodies found in the main way. The probable number of these was eagerly canvassed especially as the figures given by those who had been down the mine did not at all correspond, some placing the number as high as twenty, others as low as five. About four o'clock the leader of one of the squads communicated the important intelligence that a communication had at last been effected with " No. 3 bottom ," where a considerable number of dead bodies had been found. It may be remembered that yesterday a party who went down No. 3 shaft in the " kettle," to attempt to clear away the rubbish by which it is choked , believed they heard men shouting from the bottom of the shaft. Several explorers who had gone down No. 2 pit the same afternoon asserted that they also heard such signs of life — one voice being louder than the rest; but on going back later they found that the sounds had entirely ceased. The natural inference would seem. to be that after the explosion a small body of miners had reached the foot of No. 3 shaft , only, however, to find that exit blocked by the many tons of rubbish which the furious blast had thrown down, and after calling for assistance while strength lasted, had eventually to succumb to the insidious chok damp. The number of dead found here by the explorers amounted it is said, to 17, but the distance from No. 2 shaft being over half a mile , they could not for the time being be removed. Several of the search party brought up harrowing details of the state of the bodies below. The fierce heat and overwhelming force of the blast had, it appeared wrought sad havoc with its victims. Mutilation of every kind , including the loss of heads, arms. and legs was reported as of frequent occurrence. ; and in many cases identification , it was asserted , would prove next to impossible. Thomas Gracey, 50, married, grown-up family. Alex. Watt , young, recently married, one child. James Rae, married, supposed to be from Wishaw. When these bodies had been brought to bank, a messenger was hastily sent down to request the exploring party to come out of the mine. Several of the men, who had recently been below, had fancied they could perceive a slackness in the air which boded no good ; while the smell of burning was said to be quite sickening. Some, indeed, assured their mates on the bank that they could discern the flicker of fire against the face of the coal in some of the workings into which they had ventured to peer. Others, we believe, no less confidently discredited these allegations, Nevertheless, the proprietors of the colliery, acting in concert with Mr Ralph Moore, Government Inspector of Mines, decided that they were imperatively called upon to take the precautionary measure of closing the mine until ventilation should have been restored through the clearance of No. 3 shaft. This was accordingly done; and after half-past six o'clock this morning no one was suffered to descend. The operations were now entirely transferred to No. 3 shaft , at which, during the night, gangs of men had been engaged in the "kettle, " endeavouring to make good the damage done by the explosion. The question, how this could best be done formed the subject of animated conference on the bankhead between Mr Inspector Moore, Messrs Thomson and Logan, two of the partners of Dixon & Co., and a number of practical sinkers, the result being that a plan was approved of for energetically prosecuting the work from the top of the shaft. This will necessarily occupy some considerable time. There are said to be something like 25 fathoms of rubbish of all kinds to clear away; and, besides removing this, repairs will have to be executed on the sides of the shaft as the men descend, were it for nothing else than to ensure the safety of those engaged in the work. We understand that inquiries were made early this morning from the Home Office in regard to the extent of the disaster , of which due notice was given to the authorities there yesterday. A telegram was sent in reply to the following effect:— I am sorry to say we only discovered other three of the miners alive. The doctors think no one of the 206 men in the pit are alive. Everything has been done that can he done. It will be some days before the bodies are got up. Afternoon.—At eight o'clock this morning, Dr Robertson, Hamilton, who had been in attendance upon the three men got out alive soon after midnight, reported that Macdonald and Gemmell continued to progress favourably, but that Gainer was gradually sinking. During the early hours or the morning, Macdonald, who from the first had been livelier than the others, spoke freely to the comrade waiting upon him , though the latter tried to dissuade his friend from talking too much. He complained a good deal of pain in the right arm and cold about the feet , and frequently called for water, which, however, was given him but sparingly at long intervals. All three men lay covered with blankets, rugs, &c ., while hot-water jars were kept constantly at their feet. Shortly before nine o'clock arrangements were made for their removal to Glasgow by special train, consisting of engine, tender, and first-class carriage. The train was brought into a siding off a branch line of the Caledonian Hallway, within a dozen yards or so of the joiner's shop in which the men were housed. One by one the sufferers were tenderly placed upon stretchers, and carried to the places prepared for them. A compartment was set apart for each man and his attendant, the former lying on a temporary bed on the floor of the carriage, with the head slightly raised, and jars of hot water at the feet. Dr Robertson also accompanied the train, which left the siding a few minutes after nine o'clock, the intention being to proceed to St Rollox goods station, where conveyances were to be in readiness to take the miners to their destination. The departure was witnessed by 200 or 300 spectators , chiefly miners and their wives, many of whom could not refrain from shedding tears.. A few minutes before the train started, a "special" from Glasgow had arrived at the siding with a supply of coffins from Messrs Wylie & Lochhead's. In the coarse of the forenoon the bodies recovered this morning, with the exception of that of the man Rae, were taken home by the friends of the deceased. Later in the day, coffins were sent out to the houses of the dead, and the scenes which then took place are said to have been of the most distressing character ; in fact, one old man who had something to do with the work affirms that the spectacle he had witnessed at the bottom of the pits was not nearly so affecting as the sight of mourning widows and bereaved children. William Campbell (whose wife died a few weeks ago , and whose son is among the entombed), leaves three orphan children and a widowed mother; William Black, a widow and five or six of a family; George Semple, a widow and four children; James Sneddon (who, with three sons, and a boy that stayed in the house, are among the missing), a widow and. three children ; Geo. Semple, widow and three children; —— M'Gowan, widow and three children; Henry M'Cuskie, widow and four of a family; James M'Cuskie, brother of the preceding, widow ; Robert Halliday (missing with two sons and a stepson), widow and four children; John Bums, widow and five children ; Wm. Bums, brother of the preceding, widow and two children; James Clyde (missing, with two sons), widow and four children ; Archibald Lang (missing, with his son and Geo. Sayers), widow and several children; John More (missing, with one son), widow and five children ; — Lamb (missing, with son), widow; James Kelly, widow and three children; Francis Murphy, widow and two children; Peter Mackie, widow and two children : Joseph Miller, widow and three children ; David Martin, widow and two children; John O'Brien, widow and three children: — Roberts, widow and four children; Robert Wardrop, widow and two children ; Charles Docherty, widow and four children ; Matthew Halliday (missing, with his son Thomas), widow and five children ; John Cone and son ; Wm. Campbell (missing, with son), widow ; and three or four children; John Campbell, widow and three children; Alexander Watt, widow and one child ; David Martin, widow and two children; James Vallerley, widow and one child; John Crawford, widow and one child; Alexander Watt, widow and one child; James M'Kinnon who belonged to Wishaw, widow and several children ; Charles Divers, widow and two children; Andrew Whiteside (missing, with son),widow and four children; Thomas Wilson (missing, with two sons), widow; Frank, John, and James Welsh, the only support of aged parents ; George M'Lachlan is entombed with three sons, one of whom was married and had a child; and among the others missing are two sons of Mrs Trayner, a widow; Abraham, William, and John M'Ghee, a pit labourer; John Cone and his son ; — Ravey and son, from the Airdrie district; Wm. and Robt. Kirkland , brothers; and John and Wm. Dollan, brothers. At Priestfield Terrace, a row of houses near the pits, every third or fourth dwelling has one or more blanks in the family circle. One poor woman named Wright has lost her husband, aged about 50; her son John, aged 18; a son-in-law, and a nephew. Mrs Wright, whose daughter's brother-in-law is also amongst the victims, is left with five of a family. Joseph Gilmour, who, with his son, stayed in the same row, is survived by a widow and four children. James Liddell, whose son is also missing, leaves a widow and three children. ; Mrs Gold, a widow, has lost four sons; James M'Garrie leaves a widow and four children; and Thomas M'Culloch a widow and one child. During this forenoon relays of three men each were engaged in the " kettle" down the shaft of No. 3 pit, with the view of clearing away the obstruction to the passage of air from the one pit to the other. This obstruction, as already explained had been caused by the explosion hurling broken timber and other wreckage up the shaft, carrying away the mid-wall, and causing the sides of the shaft to fall in. It is understood to occupy a apace of about '25 fathoms from the bottom of the workings. Fresh sinkers were sent down the pit every two hours , and it was reported by some of those thus relieved that the work was proceeding satisfactorily, though slowly. At the bottom of the shaft, it now appears, there lie some 23 bodies ready to be carried to No. 2 pit so soon as the explorers can again enter the mine. At the latter shaft a steam jet was got into operation in the course of the day, for the purpose of augmenting the current of air. Though a strong force of Lanarkshire policemen are on the ground, under the chief-constable of the county, it has been found impossible to keep the crowds of people who flocked, to the scene of the disaster from approaching close to the two pits ; and accordingly, the constables have been chiefly occupied in maintaining order. Throughout the day the roads leading to and from the pits were thronged with interested spectators , and - what with the unusual traffic, what with the rain that came down in torrents for hours together - the thoroughfares were reduced to a deplorable condition, pedestrians going ankle deep in mud almost the whole way from Blantyre to the pits. This afternoon a notice has been posted, at the office of Messrs Dixon , stating that arrangements will be made in the course of a few days for the proper distribution of the Society's (or Works) funds. At present the sum at the credit of the Society is £140 , which had been subscribed by the men at the rate of 3d. per week. The Rev. Stuart Wright, minister of the parish, has been in communication with the other clergymen in the district, the proprietors of the colliery, the Provost of Hamilton, and other gentlemen, with a view to the organisation of a relief fund befitting the occasion. It is proposed that the fund should partake of a national character, and steps will, it is understood , be forthwith taken for setting the movement on foot. Meanwhile , however , the wants of the more necessitous are being attended to by private benevolence. All the injured men rescued on Monday are doing well. Evening.—Despite the pitiless rain which has fallen in drenching showers since early morning, a large number of watchers still remain at the pit-heads, in the vain hope of being of some service to those friends whom , it is feared , no aid can now avail. The far-reaching interest of the event was evidenced by the groups of persons assembled near the South Side Station, Glasgow, about five o'clock this morning, who eagerly devoured, while waiting for a train to this place, which did not start till nearly seven o'clock, the details of the explosion. On examining these groups, attention was attracted by the wild gesticulations of females who, with tears streaming from their eyes, spoke of loved relatives who had perished in this fearful calamity. Nor was the open expression of sorrow confined to women for there were men , from distant mining districts, who with broken voices enumerated members of their family that were numbered with the missing. During the earlier part of the day such lamentable scenes were being constantly enacted. It is estimated that each of the forenoon trains conveyed not less than 2000 persons to the scene of the disaster. Of the crowds which gathered wherever there was the slightest indication of anything going on, a large proportion consisted of miners, many of whom, although not bound to the place by any painful tie, were anxious to express their sympathy by assisting in whatever way might be deemed expedient by those in charge. The fact that No. 2 pit had been sealed, by order of Inspector Moore, while it caused numbers to examine that shaft with curiosity, drove most of the visitors to other parts of the field. Owing to the shift of two for two hours being increased to a shift of seven for seven hours at the mouth of No. 3 pit, the work there now proved specially attractive. The men who could not be actually engaged clustered round the great fires, that sputtered under the heavy rainfall ; and volunteers were always ready to supply vacancies, while those who could do nothing more cheered the workers. During the afternoon such strides had been made in piercing the obstructing mass of rubbish in the shaft that hopes are now entertained of the bottom being reached by midnight. The gentlemen who were noticeable in their efforts to secure satisfactory working arrangements were Mr Inspector Moore, Mr Thomson , and Mr Logan, of Dixon & Co. ; Mr Austin , another colliery proprietor , Mr David Anderson , of Messrs Merry & Cuninghame ; Mr Rankine , mining engineer ; Mr Ferrie, mining engineer ; Mr Simpson, mining engineer; Mr Hastie, manager; Mr Dunlop, jun., ironmaster; Mr Dunn , of Messrs Dunn Brothers ; Mr Wilson , Bantaskine, Falkirk; Mr Andrew Spencer, Aulton Colliery; Mr James Addie, Langloan Ironworks; Mr Russell, jun., Wishaw House; Mr Kerr, Wishaw Collieries ; Mr James Young, jun., of Kelly, and Mr Duncan, manager. On satisfying their curiosity, the greater number of those who had visited the pits strolled, regardless of the rain, over the beautiful country in the neighbourhood, or flooded the villages of High and Low Blantyre. The visitors, rough as they were in some instances , showed no inclination to disturb the houses of mourning ; and while gossiping loudly whenever an opportunity presented itself, they allowed their respect for the bereaved, by lowering their voices as they passed houses where the white blinds betokened the shadow of death. Towards evening the tide ebbed, and there were left only the sad watchers, whose vigils have been unbroken since the accident. LATEST PARTICULARS. Midnight.—It seems now pretty certain that the numbers stated, yesterday as having been in the pits. at the time of the explosion were rather under than over the mark. Several men , it seems, who were not on the published lists are missing, and it is feared , with only too much reason, that they also are in the mine. The number telegraphed to the Home Secretary this morning by Mr Ralph Moore as being still entombed was 206. As up to that time 40 men in all had been brought to the surface, this would make the total number involved in the explosion 246. If 206 are still in the mine, then 225 must have perished, as 17 of those recovered were brought up dead , and two have since expired. The exact figures cannot probably be given with certainty until the mine is cleared. After it had been closed for about eight hours, No. 2 shaft was again descended at four o'clock this afternoon by four men, all of whom had actively distinguished themselves on the previous day. A jet of steam had been introduced into the upcast earlier in the day to promote ventilation, and as the party took only engineering tools with them it was understood that their mission had reference solely to the repair of some piping at the foot of the shaft. They stayed down about an hour, and did not experience any difficulty in prosecuting their work. Notwithstanding that the weather was most unfavourable to the clearing of the mine, the atmosphere being thick and foggy, work was actively prosecuted at No. 3 shaft throughout the afternoon ; but the inconvenient and somewhat dangerous way in which it has to be carried on renders progress necessarily slow. Though the scene of the catastrophe has been visited by large numbers of people from all parts of the district, a singular quietness has latterly prevailed about the pit-head. The women have ceased their lamentations, though their woe-begone faces and tear-sodden eyes tell of a hidden grief harder to bear because unexpressed. The ministers of all denominations have been visiting the cottages of the bereaved, and pointing out to them the consolations of religion — an attention which has been received with the utmost cordiality and gratitude. At nine o'clock this evening a party of explorers again went down the shaft of No. 2. pit for the purpose of conducting air round the workings. After the men had been about two hours in the pit they came upon a live horse in one of the stables at the north side of the shaft, about 150 yards from the mouth of the pit, and near the place where the three men rescued at midnight on Monday were found. Hay, water, and warm gruel were taken down to the animal, which, at a late hour, was reported to be quite lively. The exploring party are working in relays of eight. No attempt will, it is said, be made till tomorrow to bring any of the bodies to the surface. An additional supply of coffins has been forwarded from Glasgow tonight , and more are expected to-morrow. In regard to the progress of the operations at No. 3 shaft , the most conflicting statements have been made throughout the day. This forenoon it was stated that the men were only twenty-five fathoms from the bottom ; but at midnight it was reported by gentlemen in charge that they had still twenty-six fathoms to work through. It was, however, stated by a gentleman who, though not an official of the pit, has been superintending the operations , that the damage done to this shaft is much greater than has been represented. He mentioned that the bratticing had to a great extent given way, and that at the present moment, there are upwards of 400 tons of rubbish blocking the shaft. It is right to mention that, although no facilities have been given to the representatives of the press to obtain information in regard to the accident , no actual obstacles have, so far, been thrown in their way. To-night, however, the police, acting under the orders of the newly-appointed chief-constable of Lanarkshire , ordered all the reporters to leave the pitheads under threat of arrest. An appeal, being taken. against this extraordinary procedure to the proprietors of the colliery, the action of the chief-constable was confirmed by their representatives , and it was indicated that the details published concerning the disaster should be confined to such facts as were supplied at the colliery office. GLASGOW, Tuesday night.—The special train which conveyed from High Blantyre the three men, M'Donald , Gainer, and Gemmell, arrived in the city about half-past twelve o'clock. Of course, the utmost care had been taken to prevent jostling; but the whole of the men appeared, nevertheless , to have suffered from the ride. On arrival at the Infirmary they were placed under the care of Dr Masson, house surgeon , in the burned accident ward , and nothing spared that medical skill could do to alleviate their sufferings. Despite of all , Gemmell and Gainer succumbed to their injuries, the former shortly after admission , and the latter at four o'clock in the afternoon. M'Donald, who is not so seriously burned as his comrades, is tonight a little better, though still suffering much; while a fourth man, named Bannsham , who was admitted to the Infirmary at three o'clock in the afternoon , and who had sustained the slightest injuries of the three , is so much better that there seems every probability of his recovery. Mr Alex. Macdonald , M.P., has wired from England to Mr Hughes, miners' agent at Maryhill , asking him to convene a meeting of representatives of the Scotch collieries, to be held at Wellhill, Hamilton , on Thursday. The object of this meeting, we believe, is to consider what steps should be taken by the miners themselves to do something towards raising subscriptions on behalf of the sufferers by this sad calamity. "High Blantyre, Friday morning - not withstanding the most sanguine expectations that number three shaft would be cleared early this morning, up till 9 o'clock there was still seemingly a considerable amount of wood work to be removed, and no one could tell what obstacles might be met nearer the bottom before an entrance was effected. The only cheering thing during the night was the clear frosty weather, as compared with the dismal rain which has prevailed during the greater part of the week. The arduous work in the shaft went on as usual, kettle after kettle coming to the surface loaded with the immense beams of wood, some of them entire, others shattered to pieces by the explosion. Now and then a few props would come these were considered a good sign as having come from the mine, and therefore it indicating that the lower stratum of the obstruction had been reached. All was quiet about the pit, and in the village most of the houses seemed muffled, as if the inmates were at rest. The feverish excitement of three days ago had subsided in the mournful conviction that no living being would come out of the mine. About 6 o'clock the kettle brought up a cap belonging to one of the lost men; but no trace had been found of the body. Two hours later came a horse's hoof, apparently bearing out the supposition that one of these animals had been blown up in the shaft. "Mr Moore and the engineers have just been down No3 pit and examined the work that has been done in clearing it. The progress has been slow, although the work done has been very great, and they are now within about 5 ft of the bottom of the obstruction. If there are no further obstructions, and it is thought there are none, the bottom of No3 shaft will be reached in a few hours, and the pit made safe for access to the bodies." It was stated by those in charge of the work that when it the remainder of the chief obstruction was got through, it was expected that no further impediment would be found for a good many fathoms. Near the bottom of the shaft there is another slight block, but that, it is anticipated, can be temporarily dealt with in order to reach the place where the bodies are lying. William Welsh senior, William Welsh junior, Owen Brannigan, Thomas Black, Robert Heron, John Jeffrey, Thomas McDonald, Thomas Gallagher, William Duncan, John Hill, Samuel and John Nielsen (brothers), George Watson, Andrew Forrest, William Hill, Hugh Brown, Duncan Macmillan, George Watt, Edward Doherty, P A McCaskie, Michael McKasker, John Sharp, Alexander McCall, John Little, and Thomas Wood, firemen, William Kirkland, Thomas Marton, John Pickering, oversman, and Thomas Ferguson, pony driver. Thomas McDonald and Owen Brannigan lie in the Glasgow Infirmary, the former dangerously and the latter seriously injured. Off the four bodies got up early on Tuesday morning, one still lies in the blacksmith's shop unidentified. At first it was supposed that the remains were those of the young man named James Rae, who recently came to the district; but this conjecture had proved erroneous, and up to this morning no clue had been got to the identity of the deceased. In the first list of persons supposed to be in the pit, appeared the name of Conn O'Donnell, but it has been ascertained that Conn did not go down the shaft on Monday, though his brother John did, to see about sending up some coal they had won. 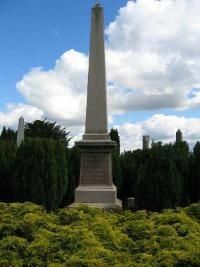 Another fortunate escape was made by young man named William Thomson, who, for some reason or other, did not go down on Monday; while his brother, whose duties as ostler did not admit of his taking such liberty, was among those who perished. In consequence of the accident, all work at Colliery has been entirely dislocated, and the men employed at No. 1 and No. 4 pits have been thrown out of employment. The total number employed at the High Blantyre collieries of the firm was, we believe, prior to the accident, about 676, so that over 470 men have been temporarily deprived of their livelihood. On it being represented to Messrs Dixon that considerable distress was consequently beginning to be felt in some families, the firm at once intimated that a payment of 10 shillings to each man of No. 1 and No. 4 pit, as well as those who escaped from No. 2 and No. 3 pits, would be made to enable them to tide over their difficulties. This action has been hailed with gratitude by the miners, and the paying of the gratuity at the cashier's window occasioned considerable stir during the forenoon. Evening - for some hours of the afternoon, little occurred to relieve the tedium of waiting for the long delayed clearance of the shaft. Some little sensation was caused about 2 o'clock by the doings of a not altogether sober miner, who, while wandering through a field not very far from the pits, broke out into denunciation of the proprietors, which soon attracted a little crowd echoing a parrot like way the cries of the previous day. This would be agitator loudly characterised it as shameful that No. 2 pit should be kept closed when everything was right at the bottom. Continuing in this strain, the fellow seemed to be getting into the good graces of his audience, when unluckily for his popularity, he sought refreshment from a flask produced from his pocket. No sooner had his sympathy been in this way identified with its more immediate motive, than cheering turned to hooting, and, backed up by a policeman, the miners speedily bundled the offender off the ground. Now and then an interesting meeting a friend would occur near the pit offices. A young man, for example, was heard telling his acquaintances how his name had found its way into the list of killed, from the fact that, but for some irregularity, he should have been down No. 2 pit at the time off the explosion. This lad, Doherty by name, was the one of a gang of eight who were working under the direction of a contractor named Peter Carlan, whose working face lay at the extreme end of the pit, about half-a-mile from the foot of the shaft. Carlan descended on Monday morning at the usual time, accompanied by five of his men. All are now, it is supposed, lying dead at the place where they worked, while Doherty and the other two young men (both of them belonging to Springburn) remained above ground, not feeling disposed to turn into work so early in the week. Another fact which soon afterwards became known went, however, to counterbalance the satisfaction felt at the safety of three men being thus secured. This was the inability of anyone to give account of two men, supposed to belong to Carluke, who, it is said, arrived at Blantyre in search of employment so recently as last Saturday night. These men gave the names of William Scott and John Williamson, and are understood to be brothers in law. No entry of their descent into either of the fated pits on the morning of the explosion is recorded in the books; but as nothing has been head of the pair since the accident, there seems too much ground for the belief generally expressed today that they must be in the mine; and in that case two more must be added to the list of victims by the catastrophe. For the report, circulated on apparently trustworthy authority, tended to amplify the official details published with reference to the identity of those killed. Among other deaths accounted for it in the first list, without any name been given, were, it is stated, those of John McKelvie and Thomas McCulloch. The former was a lad 19 years of age, who belonged to Burnbank, Parkhead, but who had for some time been working at No. 2 bottom in connection with the McKillops, whose names are among lost. McKelvies mother is at present lying seriously ill; and so much anxiety is felt regarding the immediate recovery of his remains that two friends of his have been hanging about the pit head all day, hoping every hour that an opportunity might be afforded of descending. As to McCulloch some doubt seems to exist, it not been known whether his death has been reported as that of an unknown man, or whether his disappearance represents another addition to the gross total. In the early part of the week it was not thought certain that he had gone down to work, but this is now looked upon as beyond doubt; and the another young widow has accordingly been left upon the hands of the Relief Committee. This sufferer, it should be noted, is not to be mixed up with the other workmen bearing the same name who have lost their lives, as the families are not connected in any way. For an hour and a half in the afternoon distressing symptoms of grief were again called forth by the funerals of three men whose remains were recovered before the pits were closed. The first was that of the unidentified body which has lain in the blacksmith's shop since Tuesday morning. This internment had been delayed as long as possible to give opportunity for claiming the corpse; but, before and then it was decided that the funeral could not be put off further, and accordingly the necessary order for immediate removal was obtained from the Procurator Fiscal and the medical man. At half past two a short religious service was conducted over the body by the Rev. Stewart Wright, Minister of the parish, who was accompanied by the Reverend Mr Patterson, of Burnbank Free Church. When the coffin was borne out of the shop, Mr Wright, addressing the men who had gathered round the place, pointed out that as the burial was that of a stranger, it was only fitting that all should show respect for their deceased brother by following the hearse to the grave. In response to this invitation, about 100 of the workmen fell into procession; and when the village streets were reached the troops of mourners were swelled by several women, who by their weeping and other expressions of grief gave to the melancholy spectacle a yet more affecting tone. When the cemetery was reached, and the coffin brought alongside one of the long trenches, the two clergymen placed themselves in position for taking cords and others were forward to take part in the sad duty of lowering of the coffin. Not so seemly however, was the behaviour of the workmen employed in digging the trenches. When requested to allowed 2 or 3 of his men to lend a hand in placing the coffin in the grave, the foreman, we are informed, said his orders (about which there surely must have been some misunderstanding) precluded him from doing so. This awkward scene lasted for several minutes, until, amid the loud protests of the miners, some of the company themselves did what was required. The supposition regarding the identity of the unknown deceased is that he was a new workmen in the pit and had been going under an assumed name. The funeral of the firemen, Wright, who resided in Priestfield Row, also occasioned a considerable display of feeling. When the hearse started from the house door (after service conducted by Mr Wright) every cottage turned out its bereaved and wailing women and children. All along the way to Baillieston, about eight miles distant, groups gathered by the roadside, and as many of the passers by took places behind the hearse, the internment was ultimately made in the presence of a large company. The only other funeral that took place in the course of the day was at Larkhall, in the cemetery of which the remains of James Bolton have been interred. A proposal has, we believe, been made, and very favourably received, for the erection of the monument in Blantyre cemetery, between the two burial trenches, recording the circumstances of the accident. It was not till about 3 o'clock this afternoon that the aspect of matters at No. 3 shaft promised any speedy termination of the labours so long carried on there. Near the pit head lay a heap of broken timber about 100 ft long, 20 ft wide, and 4 ft high, sufficiently attesting to the difficulties which the workmen have had to contend with. The wood was mostly the wreckage of the heavy battens of which the walls separating the three compartments of the shaft were constructed. At 3 o'clock the kettle was still bringing up unwieldy fragment of these logs; but at this time it was reported to be every minute expected that the rubbish remaining in the shaft would give way and fall to the bottom. Again, however, the deceptive nature of the obstruction arrested itself; and it was not till near 5 o'clock that the wreckage actually tumbled in. No sooner had this occurred then another obstacle unluckily appeared to impede progress. Hardly had those at the top been made aware, by the crashing of timber, of the success that had been achieved, when the sinkers came up with the report that they had been driven out of the shaft by fire damp. For a short time before the clearance was effected, indications of this had been observed; but doubts were entertained as to the reality of the danger till after the fall of rubbish, when the gas caused the flame in one of the lamps to dance in so threatening a way that the men immediately extinguished their lights. After an interval of 20 minutes had been allowed to elapse, Mr Pickering, oversman, and one of the sinkers went down the shaft. They remained for some little time and on returning to the surface reported that the air was quite clear and proceeding in its natural course down the shaft. Operations were accordingly resumed by a regular squads of sinkers. Mr McDonald, MP, who happened to be on the ground, pointed out the desirability of as few people as possible being near the mouth of the shaft, in case of fire damp communicating with the coals burning in iron gratings at the pit head, and though it was represented that there was no danger of the nature hinted that, orders were given to the police to clear the ground adjoining the mouth of the shaft of all but the workmen employed. Mr Moore, Mr Simpson, Mining Engineer, Glasgow; Mr Duncan, pit manager, Bishopbriggs, and Mr Kirkwood, manager to Hamilton, McCulloch, & Co, afterwards paid a visit to the shaft and preparations were made for their descending the pit. After the party, however, had been duly equipped in waterproof covering, a message was sent up by the sinkers that a body had been come upon amongst the rubbish. This body the miners were ordered to bring up, and at the same time sheeting was sent down in order that it might be properly covered before reaching the surface. Dr Goff, Bothwell, who examined the body after it had been raised to the surface, found that it was greatly disfigured about the face, while the back of the head was reduced to something like pulp, both limbs being broken and the feet slightly burnt. The deceased appears to have been about 14 or 15 years of age, and it is conjectured that having been a drawer in the pit, he was blown up the shaft by the explosion while in the performance of his duty at the mouth of the workings, his head had evidently been mutilated by being violently hurled against the wreck which prevented it from getting further up the shaft. After the face is washed, it is thought the features may be identified by the boy's relatives. As soon as the body had been taken from the pit, the official gentlemen above named were lowered down the shaft, where they remained for fully a quarter of an hour. On returning to the pit head, Mr Moore gave it as his opinion that the obstruction in the shaft had almost disappeared, and that in a very short time it would be found practicable for him and his colleagues to re-enter the pit for further examination. If the workings were found in as good order as seems to be anticipated, the work of removing the bodies will be proceeded with immediately after the inspection. It is known a that there are some 27 bodies at foot of the shaft; and of course these will be first brought out. In the course of the afternoon the sinkers, it is said, got hold of part of the man's body, but before being properly secured it fell to bottom of the pit. Midnight - though it was reported about half past 8 o'clock by Mr Moore that the shaft was all but cleared, a shift of sinkers who came to the surface about 10 stated that a good deal yet remained to be done before safe communication can be had with the bottom of the mine. Doubts were also expressed as to the condition in which the bottom might be found, and everything pointed to more delay before it any party could be sent down to recover bodies. The night is dark and cold, and pelting showers of rain are a frequent occurrence; but despite the unfavourable weather, a considerable number of miners from the rows hang about barricades awaiting with evident anxiety the scraps of news that from time to time it can be gathered as to what is transpiring below. With thoughtful consideration, Mr John Thomson, the principal manager of the Colliery, ordered one of the huge fires which burned at the pit mouth to be taken outside the barricades for their comfort. At intervals a waggon could be seen gliding almost noiselessly along the railway with a ghastly load of coffins, which were deposited in the shed alongside the engine house. In regard to the body of the boy recovered in the shaft, it may be mentioned that hardly a thread of clothing was found upon it, the flame of the explosion having evidently burned it up. On the body been laid out grave doubts were expressed as to whether identification was possible, what remained of the features having been distorted in the hideous way. A scrap of clothing found sticking to the flesh was in these circumstances carefully preserved. A somewhat alarming incident occurred just as one of the official examinations of the shaft made in the course of the evening was commencing. A man at the offside of the pit head, who had been trimming a paraffin lamp, accidentally allowed a quantity of the burning oil to come in contact with some inflammable material, which it immediately set on fire. A rush was made to the spot by a number of workmen, as it was feared that flames might take hold of the wooden screen around the shaft; and after some difficulty, the fire was extinguished. Considerable commotion was created at the pit head by the incident. One am - the work of clearing the rubbish in No. 3 pit still proceeds. A fresh squad has just gone down and it is anticipated that they will finish it. Several doctors at the pit mouth in case of accident to the exploring party. Glasgow, 1:30am - the two miners, McDonald and Brannigan, lying in the Royal Infirmary here, continue to improve, and are in a fair way of recovery. The relief fund - A private meeting of the local relief committee was held this afternoon - the Reverend Stewart Wright in the chair - when the resolution was adopted expressing willingness to amalgamate with the general committee when formed and to co-operate with them in every way. Afterwards at the meeting in public the committee appointed a deputation to attend a public meeting on Monday with the view of reporting what was proposed to be done. It was stated that already sums amounting in all to between £1,400 and £1500 had been intimated. A relief committee was appointed for the purpose of investigating the circumstances of each of the sufferers. The sub-committee of the Iron and Coal Masters met yesterday afternoon at Glasgow, when it was resolved to communicate with the trade generally by circular, requesting subscriptions. At the meeting of the Lord Provost's committee of Edinburgh Town Council held yesterday, the Lord Provost, acting as trustee for the administration of a balance of about £1,200 assigned to the district now in question from the Hartley Colliery Fund, indicated, we understand, the opinion that the whole of that amount should be at once applied to the present case. The committee we believe, resolved to recommend to the town council on Tuesday next that an Edinburgh subscription list be headed with 100 Guineas from the corporation. Left: Disaster memorial erected on the centenary in 1977.